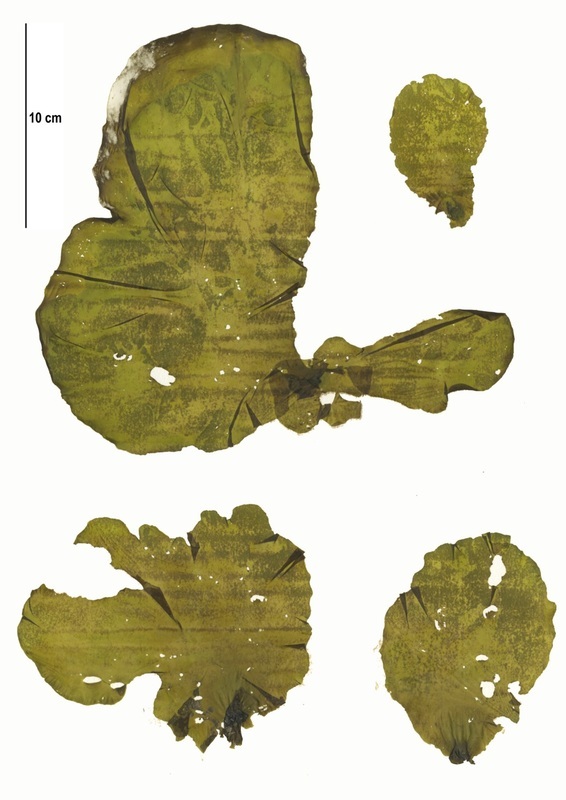 Specimen collection numbers PTM 414 and SCL 15382 in the UBC Herbarium Algae Database. Search the collection numbers in the database for more information on these specimens, or search the species for further occurrences. Images courtesy of Sandra Lindstrom. ​This green seaweed has flat, bright green blades that typically grow to about 25-30 cm in length. Initially, the plant grows as a small sac that later splits to form the characteristic flat blade. Blades are one-cell thick, and delicate, and nearly opaque. Blades grow from a small, cushion-like holdfast, and are typically bright green in spring, and darken with age. 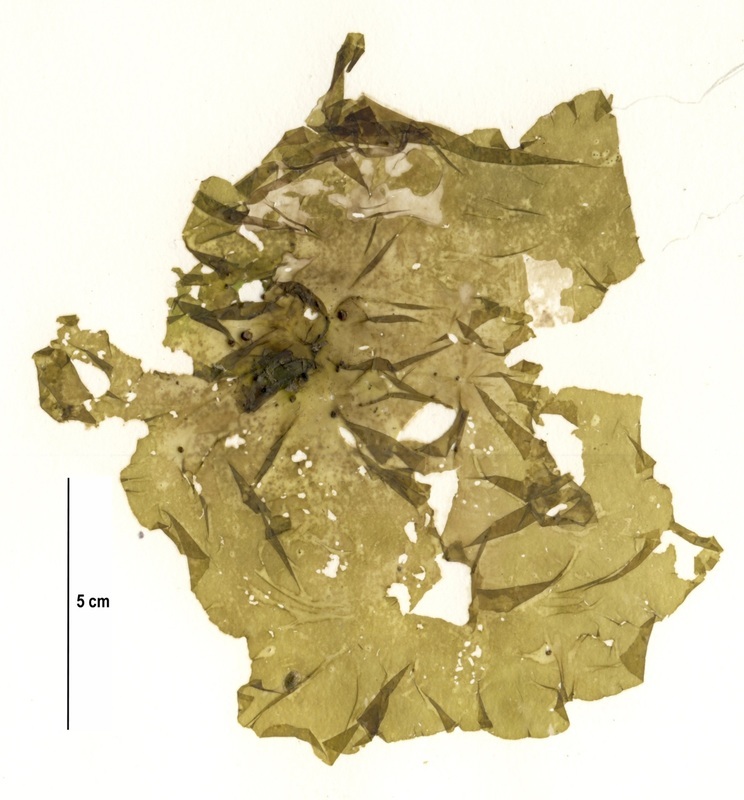 ​Sea lettuce (Ulva lactuca) and sea cellophane (Monostroma grevillei) are both bladed green seaweeds. However, U. lactuca is two-cells thick and thus more robust than dark sea lettuce, and is also lighter in colour. Monostroma grevillei is lighter in colour, and much more transparent than dark sea lettuce (even though both are one-cell thick). Dark sea lettuce also generally grows lower in the intertidal and subtidal zones than U. lactuca and M. grevillei. This species is typically found on pebble or cobble substrates in protected and semi-protected areas. It grows in the low intertidal and subtidal zones from the Bering Sea and Aleutian Islands south to northern Washington. Its range also includes Korea, Japan and Russia. ​Dark sea lettuce becomes very dark brown (almost black) when dried due to the presence of dopamine in the cells. The dopamine functions to deter herbivores such as the sitka periwinkle (Littorina sitkana), kelp isopod (Idotea wosnesemskii) and green sea urchin (Strongylocentrotus droebachiensis). O'Clair, R. and Lindstrom, S. Ulvaria obscura (Kuetzing) Gayral. In Klinkenberg, Brian. (Ed.). E-Flora BC: Electronic Atlas of the Plants of British Columbia. Lab for Advanced Spatial Analysis, Department of Geography, University of British Columbia, Vancouver. Accessed 2015-11-13. Van Alstyne, K. L., Anderson, K. J., Winans, A. K., & Gifford, S. A. (2011). Dopamine release by the green alga Ulvaria obscura after simulated immersion by incoming tides. Marine biology, 158(9), 2087-2094.